It was released about a week ago; I just went to Shibuya and bought it. I know I said I'd given up reviewing music, but what the hell. 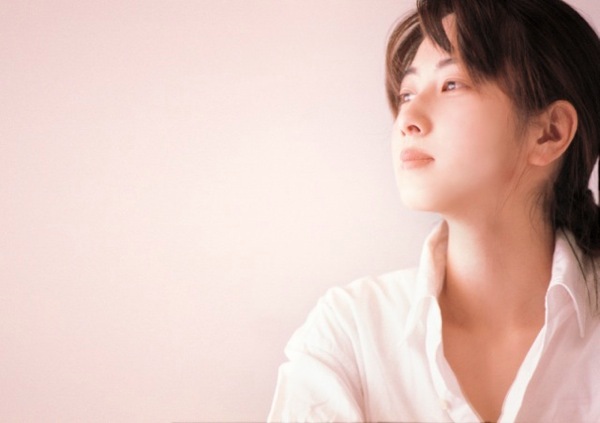 Sifow's first album, Clarity, was on the whole greatly satisfying (although I still would have liked it to have included the original version of 'Jewel' as well as "I Uta"), but it suffered in places from sounding too much like Hamasaki Ayumi. Love Spell still has some Ayu-soundalike patches, particularly on the ballads, but it's overall a more confident release with improved production. Sifow's tracks have always shown a willingness to experiment with unusual sounds (the bagpipes on 'Clarity', for example) and song structures while still retaining a basic J-pop template, and most of Love Spell continues the trend. Anchored by a strong batch of singles, Love Spell is proof that Sifow is in it for the long haul. While her total mainstream breakthrough might not have come just yet, she has such a solid musical base and diversified set of careers (in music, writing, business, and fashion) that it's only a matter of time before she completely takes over. Love Spell is more dance-oriented than Clarity, with funkier beats and more of the trance-influence that previously inflected some of her remixes. There are more beats, breakdowns, and electronic flourishes than before, adding up to an almost sultry mood at times. If Clarity sometimes retained the prissiness that can befall lesser-quality j-pop, in Love Spell Sifow has well and truly settled into her soundworld, sounding thoroughly adult and convincing. Opener (and second single) 'Rule', with its sighs, swirling chorus and almost trip-hop beat, functions as a pretty telling entrance, recalling songs like 'Chain' from Clarity while still pointing towards this album's new directions. Three-quarters of the way through the song there's a from-out-of-nowhere interlude of processed guitar, which, while brief, still demonstrates the production's capacity to surprise. Small touches like this are all over Love Spell - the best part doesn't necessarily come at the beginning of each song, and tracks are free to dart off in unexpected directions. 'Tokyo Love Night' is a standout, and at once feels like something that wouldn't have been on Clarity - it's more immediately danceable than anything before it, with a better beat and more detailed production. There's a hint of Kylie Minogue's "Love at First Sight' here, but combined with a fuzzed-out bass that's more reminiscent of 'Myxomatosis' by Radiohead. The single 'Carat' is probably my favorite track here, a propulsive blast of futuristic overdrive. In the promotional video, Sifow poses with a car while multicolored speedlines streak past, and it's a fairly accurate representation of 'Carat''s sound. Since Sifow's voice is far from overpowering, it sometimes fades into the background in her weaker tracks, but in 'Carat' it's pushed to the forefront to match the beat, and the song is all the better for it. 'Natsu Hanabi' combines the dance production with a more traditional palette of sounds, matching strings and drums to great effect. The song manages to aurally evoke the summer fireworks of its title, and while listening to it it's difficult not to imagine being at some kind of matsuri, sipping beer and watching the dancers. 'Ai-Ai!' is another highlight, and probably the greatest musical leap Sifow has taken yet. It's straight-up old-style disco, spliced with breakbeats and a funk rhythm. Sifow's voice plays around more here than usual, dipping to a lower register and then leaping higher again, combined with multiple overdubs. The lyrics are basic and the "ai-ai-ai-ai!" vocal hook is almost moronically simple, but this minimalism is somehow more compelling and effective than a more complicated treatment would have been. And there are at least two other deeply catchy vocal hooks besides the aforementioned chorus. The production pulls the three-quarters trick again here, inserting an electronic bridge towards the end before breaking back into layered vocals. This is probably the most exciting track here, and definitely the most unexpected. Sifow remains highly inventive and highly underrated, and if she stays as prolific as she's been recently, she's sure to continue expanding her fanbase. Love Spell is a more than worthy followup to her debut, and if she maintains this consistent level of quality, she's more than capable of supplanting more repetitive idols (*cough* Koda Kumi *cough* ). Lastly, the disc is worth getting just for the accompanying music videos for 'Carat', 'Rule', and 'Natsu Hanabi.' All of them are available on youtube, of course, but they deserve to be seen in full-screen with high resolution. In true Sifow fashion they're almost compulsively opulent, full of gold and butterflies, baroque decorations and costumes. Not to be missed.